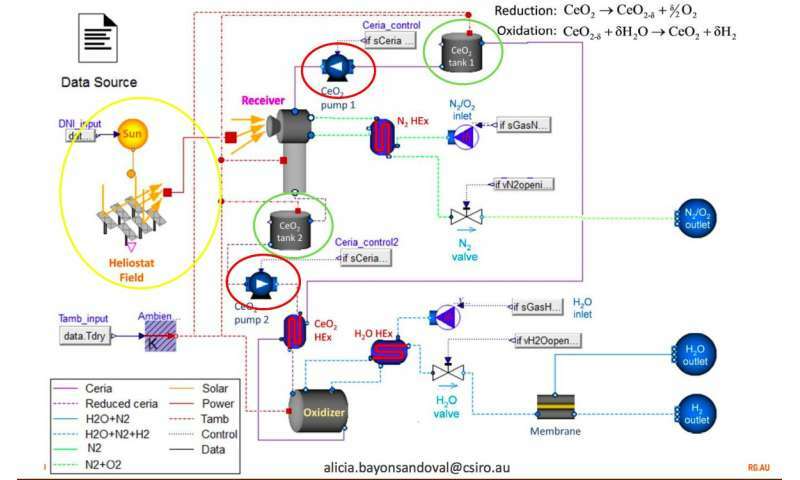 Researchers have built a new dynamic model showing how hydrogen produced with concentrated solar thermal energy can be made more continuously through a novel seasonal control strategy with ceria (CeO2) particles buffering the effect of variation in solar radiation. A paper, "Dynamic Model of a Continuous Hydrogen Production Plant Based on CeO2 Thermochemical Cycle," presented at the SolarPACES2017 Annual Conference, proposes using ceria particles not only as the redox reactant in hydrogen production, but also for heat storage and heat transfer media (or medium) to control the temperatures. Hydrogen can be produced by splitting water (H2O into H2 and oxygen) at very high temperatures using concentrated solar thermal (CST) - avoiding today's use of fossil fuels for hydrogen production. Using mirrors reflecting focused sunlight onto a receiver, CST can generate very high temperatures for thermochemical processes in a solar reactor, up to 2,000°C, and can store solar energy thermally so it can dispatch the energy when needed. Most industrial processes require continuous conditions to be able to control the end products to a specific composition and optimize operation at the highest possible efficiency. Commercial thermal energy storage media like molten salts are limited to temperatures below 600°C so they aren't suited for high temperature processes like solar thermochemical hydrogen production. But ceria (CeO2), which is already used in a solar reactor at a very high temperature to produce hydrogen, can be used as thermal storage media on top of being a reactant. 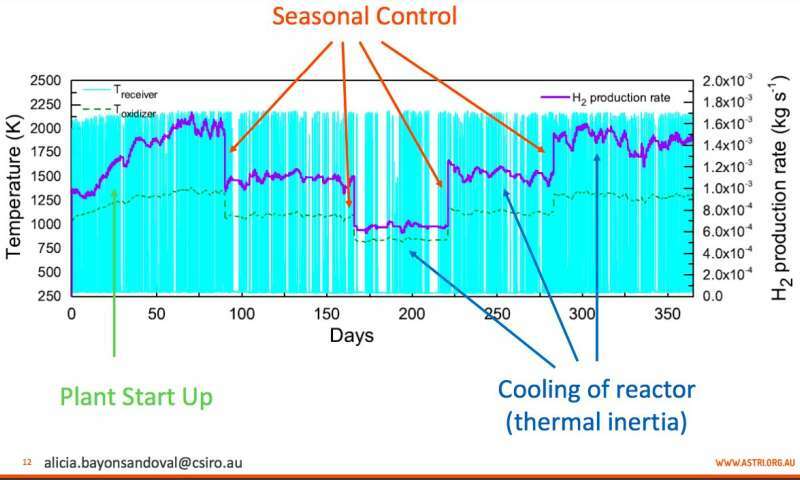 Researchers Alicia Bayon and Alberto de la Calle from Australia's Commonwealth Scientific and Industrial Research Organization (CSIRO) created a dynamic model showing year-round hydrogen production with ceria. They model a way to store the energy in ceria particles, adjusting for daily variation in solar radiation with seasonal controls, to produce a continuous flow of hydrogen. "There are other researchers that also proposed a reactor of particles of ceria," said Bayon, the co-author of the paper. "Our main contribution is that we developed a dynamic model of all the components together to prove that this system can work under real solar conditions." "In our work, we developed a dynamic model to reproduce how different components can work in real solar conditions. We needed to correct for the effect of the variation in the solar resource daily and over the year. We also proposed a system configuration and a control strategy to produce a continuous flow of hydrogen." "We think that in the future if a system can be developed like this the actual efficiency of the process itself could be very high compared to the efficiencies that people are seeing now with fixed-bed reactors, of 5.25%." One of the ways to make solar thermochemical hydrogen is in a two-step redox process that splits water to hydrogen (H2O into H2.) This process uses ceria (CeO2) as a redox material and has been experimentally tested in a 'fixed bed' as a solid immovable porous foam in the reactor, with the gases passed through it to perform the reaction. The challenge of the fixed bed operation is keeping the hydrogen production constant ensuring temperature switches after completion of the individual process steps. "If you have to cool down and heat up the reactors and the tanks every day you will also have to spend energy doing that so your efficiency will decrease," said Bayon. Previous research has focused on controlling the reflected sunlight by in some way modulating the light from the heliostats when there is "too much" solar radiation overshooting the temperature needs of the first step of about 1500°C. And in this model too, partial heliostat defocus also helps prevent temperatures getting too high in the receiver/reactor. But that means essentially throwing away usable energy. Instead, they model controlling daily and seasonal variation in solar energy over the year, by using ceria not only as the reactant, but also as the heat transfer and heat storage medium, in particle form. Controlling the flow rate of the ceria particles helps to control the heat absorbed in the solar thermochemical reactor, for greater efficiency. Bayon explained why. "In a fixed bed the amount of ceria is always the same, the ceria foam can be 'activated' once every day. Once the ceria is active for the hydrogen production, the heliostats have to be defocused to perform the water splitting reaction. Instead, we used cerium dioxide as a solid chemical in particles, like a powder or sand, so the particles are heated at the receiver, stored hot and used for producing hydrogen when needed. They are also recirculated through the system and the flow of particles never stops. This way we can keep on heating the particles, taking up the maximum amount of available solar energy at the receiver, store them in a tank and later, use them in the redox reaction to produce hydrogen. In this way, ceria particles use solar energy more efficiently." Bayon and de la Calle model a process that would use ceria particles, flowing through the receiver to be heated, on to tanks where the mass of sand-like particles can be stored, and then sent to particle conveyors which regulate the flow rate and thus control the temperatures at the step one and step two reactors. A continuous stasis is achieved. "From one tank the ceria goes to the first reactor then it goes to the other tank. When tank one level decreases, tank two level increases, so over the year – and every day – it goes up and down, depending on how much we operate the receiver and the oxidizer," she explained. "It is probably one of the biggest engineering challenges, because we have to transport the particles at high temperatures, and we have to keep the system free of oxygen too." When the particles get to the second reactor for the oxidization step, which is exothermic (it gives off heat) they are still very hot, because of thermal inertia. "So we would like not to put energy in the oxidizer reactor because our efficiency will decrease. In the oxidizer, we have to make a compromise between operating at constant temperature and being efficient. We operate the oxidizer at lower temperature than the receiver. So if it's possible, we don't use any additional source of energy apart from the reaction heat and the sensible heat stored in the ceria particles. Using additional energy will lead to energy losses; the efficiency of the process will decrease," she pointed out. "It has a cooling controller because we want to control the temperature at the oxidizer to be constant that helps to maintain the hydrogen production rate constant too. However, we also need to control the flow rate of ceria particles in the oxidizer reactor, which implies an additional challenge. We are currently working on a new control strategy to try to maintain variations lower than 20% on the hydrogen production over a year of operation." Recently particle receivers have been getting research attention because of the potential efficiency advantages. But particle-based solar thermochemical processing is at the cutting edge of solar fuel research, creating a challenge. A model has to be based on real life, said Bayon. "The main challenge that you face is to demonstrate that your model reproduces reality. To me if a model is unrealistic it is not useful." "It was quite hard to make it really realistic because you need experimental data to validate the model. Some of the models could be validated but others couldn't, because we do not have experimental facilities at least at this scale," she said. "Assuming you know all the physical and chemical phenomena involved in the processes, the main challenge is that you also have to reproduce the real behavior of the equipment itself. This is one of the most difficult things when you develop a model. Especially in solar thermochemical hydrogen production as there is no commercial plants developed yet." Yet it is theoretical models like this that are the necessary forerunners of experimentation.